Flaxseed Oil is derived from flax seeds (also known as linseed). It has benefits in the treatment of rheumatoid arthritis, high blood pressure, hormonal disorders, inflammatory disorders, weight loss etc. Flaxseeds are used in traditional medicines since ancient times. Flaxseed is a rich source of essential fatty acids. Flaxseed oil is also used as purgative for constipation. It helps treat wide range of disorders from lupus to heart ailments. Omega 3s: Unsaturated fatty acids that is good for heart. Fiber: It is rich in fiber and helps improving bowel health and digestion. Lignans: They contain antioxidant properties that are 8000 times more than other plant derivatives. Flaxseed oil is an abundant source of essential polyunsaturated fatty acids like alpha linoleic acid. This essential fatty acid along with other related chemicals help in treating inflammation and that is the reason why it is used for treating rheumatoid arthritis and other swelling diseases. Abundant availability of omega 3s in flaxseed oil helps lower LDL cholesterol and helps reduce the chances of heart related disorders. Moreover, you need to lead a healthy lifestyle as well. Flaxseed oil helps in reducing blood pressure and inhibits inflammatory reactions, which may cause poor blood circulation and artery-hardening plaque. Studies have mentioned that flaxseed oil helps in preventing colon cancer, prostate cancer and breast cancer. Plant form of alpha linoleic acid reduces the chances of prostate cancer whereas as ALA from dairy products and meat might increase the chances of prostate cancer. Omega 3s helps prevent replication of cancer cells particularly in colon cancer. Lignans in flaxseed oil help prevent certain forms of cancers and combat against virus, bacteria as well as those infection-causing microbes (bacteria or viruses) that cause shingles and cold sores. Lignans present in flaxseed oil can block enzymes that are responsible for hormone metabolism and inhibit tumor cell growth. Alpha linoleic acid in flaxseed oil acts as a cardio protective. Add flaxseed oil to your diet and it can help lower the risks of heart disorders, blood pressure, regulates heartbeat and promotes heart health. Flaxseeds are loaded with fiber, which helps keep you full for a longer time. It curbs your appetite and helps burn fat. High fiber in food aids in healthy metabolism and weight loss. Deficiency of omega 3s might lead to Crohn’s disease. Anti-inflammatory properties in flaxseed oil help treat inflammation and diseases like colitis, constipation and Crohn’s disease. 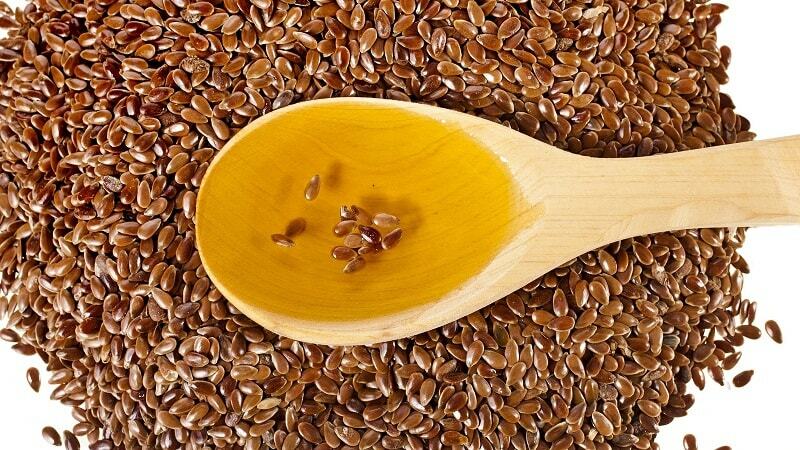 Flaxseed oil is also effective in treating diverticular disease and hemorrhoids. Flaxseed oil is abundant in vitamin, minerals and EFAs. Regular usage of flaxseed oil over the scalp helps prevent hair fall, flakiness in scalp, dandruff and promotes hair health as well. Hair problems caused due to eczema and psoriasis of scalp might respond to the anti-inflammatory properties and skin revitalizing actions of flaxseed oil. It is good for your nails as well. EFA of flaxseed oil help in transmission of nerve impulses and help treat conditions such as tingling and numbness. This oil is found effective in treating Parkinson’s disorder. For a short-term usage, flaxseed oil is considered safe for adults when taken in moderate doses. 30gms a day/ two tbsp. full or larger doses of flaxseed oil can cause diarrhea and loose stools. Pregnant women are not supposed to have flaxseed oil as few research studies indicate higher chances of premature birth particularly after the second trimester of pregnancy. Flaxseed oil might even increase the chances of bleeding. Hence, caution is advised for people having any kind of bleeding disorders. It might even lower blood sugar levels and hence it is better to avoid it for people having diabetes or hypoglycemia.